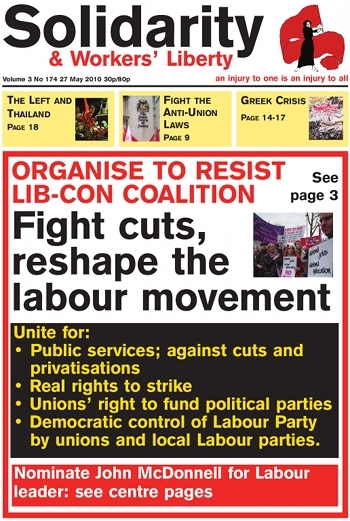 Fight cuts, reshape the labour movement! Stop this free market in state schools! Thailand: assessing the "red shirts"
Labour Party leadership election: back John McDonnell! British Airways strike: "Walsh wants to break the union"
What do the anti-union laws say? Anti-union laws: "workers must defy injunctions"
Student unions: "remould a rank-and-file student movement"
Middlesex University: defend the student and worker occupiers! Film Review: "The Ghost Writer"
For the fight now coming against the Tory-Lib coalition government's cuts, we need to get the labour movement into different shape. Individual local cuts can and will be defeated by one-off campaigns. A local campaign has recently defeated plans to close the Accident and Emergency unit at Whittington Hospital in north London. That is good and important. But by itself it will only nibble at the edges of the £6 billion cuts announced on 24 May, and the much bigger cuts to be announced on 22 June. Maybe it will only shift cuts from one area to another. The government’s first Queen’s speech was a mixture of cuts (but just the first round), policy built on New Labour’s “legacy” and various concessions to the Lib-Dems — most of which had already formed the basis of the pre-nuptial agreement between the two coalition partners. But the headline policy on schools reform, while being a logical step on from New Labour rule, was a giant step… towards a completely free market in state-funded education. And any imprint of historical opposition from the Lib Dems to such things as Academies was nowhere in evidence. 40,000 Romanian workers took to the streets to protest against proposed wage cut, with union leaders threatening a general strike for May 31 unless the government backs down. Emile Boc, the country’s Prime Minister, has called the cuts (which aim to cut public sector pensions by 15% and public sector wages by 25%) “the only viable solution for the country’s future.” The IMF predicts that Romania’s current number of unemployed workers (750,000) could rise to 1,000,000 by the end of the year. Representatives from anti-fascist and anti-racist campaigns in London, Stoke, Derby, Manchester, Liverpool and Nottingham met in early May for the first committee meeting of a new network of organisations determined to forge a “different” approach to combating the BNP and EDL. Those organising in the new network have drawn the conclusion that the lack of democracy and the political choke-hold exercised upon existing anti-fascist networks is no longer tolerable and hinders effective action against fascists and racists. Kate’s not a very nice woman and neither is her boss. She spends her working hours raising money for an organisation that is ruled by fear. Kate knows that her boss is not to be messed with — his friends, associates and colleagues are “serious” people. So when she opens the mail one morning to find a picture of her boss holding a shotgun, Kate knows it will not be a good day. This film about a small cell of Sheffield-based terrorists who conspire to wage Jihad against the West by slaughtering innocent civilians is, believe it or not, extremely funny. Tom Unterrainer went to listen to David Rovics singing his songs. American radical culture has suffered a number of notable losses of late. Most recently Howard Zinn, and before him Utah Phillips, Kurt Vonnegut and Studs Terkel have passed from the scene of the living, to be remembered by their words and music alone. “The Communists are further reproached with desiring to abolish countries and nationality. “The workers have no country. We cannot take from them what they have not got. Since the proletariat must first of all acquire political supremacy, must rise to be the leading class of the nation, must constitute itself the nation, it is, so far, itself national, though not in the bourgeois sense of the word. Ten weeks after they occupied the central district of Bangkok, the United Front for Democracy against Dictatorship (UDD), known as the red shirt movement, was repressed and driven out by the Thai army last week. Overall the Guardian (22 May) estimates that 83 people have been killed and 1,800 injured over the last few months.